The graphic above depicts the incidence of Crohn’s disease by country (darker blue = higher incidence). It is adapted from the 2013 publication by Ng et al. Geographical variability and environmental risk factors in inflammatory bowel disease. Gut oi:10.1136/gutjnl-2012-303661. It mirrors the map for prevalence of Johne’s disease by country that can be found on the Dairy/Epidemiology page. Whether MAP is a zoonotic pathogen (infection of animals transmissible to humans) is the single most critical scientific question regarding this pathogen. The answer will drive every facet of the diagnosis, control and prevention of this infection in animals. If not a zoonosis, then Johne’s disease is a bothersome, but not overly important, animal health issue. On the other hand, if it is a zoonosis, then MAP affects animals and humans alike, and animals are the source of human infections and disease. Thus, it would demand more aggressive control of MAP in food-producing animals to protect human health. The question of whether MAP can infect and cause disease in humans is one or today’s most hotly debated and controversial areas of MAP scientific inquiry. Since new scientific publications dealing directly or indirectly with this topic appear frequently, it is challenging to keep this part of the johnes.org website up to date. We are addressing this by formulating fairly short answers to the more common questions and linking to publications and websites that can lead interested readers to more detailed information and sources that are regularly updated. How can humans be exposed to MAP? Does MAP infection cause Crohn’s disease? What are the arguments for MAP as a cause of Crohn’s disease? What are the arguments against MAP as a cause of Crohn’s disease? Is there a genetic component to acquiring Crohn’s disease? Is genetics relevant to the theory that MAP contributes to Crohn’s disease? Has MAP been described as a factor in human ailments other than Crohn’s disease? 1. How can humans be exposed to MAP? Before listing potential routes of human exposure, it is useful to recap MAP’s life history. The main reservoir for MAP in nature is infected animals. MAP is considered an obligate pathogen, meaning that it replicates in infected animals. Among animals, MAP is found primarily in ruminants such as cattle, sheep, and goat. (Non-ruminant animals such as omnivores and carnivores are infrequently infected with MAP and the infection rarely progresses to disease.) Ruminant infections begin when MAP is swallowed. MAP then invades the intestinal wall, invades white blood cells called macrophages and starts multiplying. As the infection slowly progresses (often many years pass before an animal appears sick), MAP spreads from the intestine to multiple other tissues and organs in the animal via the blood stream. The liver, spleen and lymph nodes filter MAP from the blood stream. Inside the animal the highest number of MAP can generally be found at the initial site of infection, the terminal small intestine (ileum) and in lymph nodes. An infected ruminant excretes MAP in its manure . The organism may also appear in the infected ruminant’s colostrum and milk, but in far fewer numbers. Typical farm manure management practices may result in contamination of soil and water with MAP. Process meat products from MAP-infected cattle, goats and sheep. 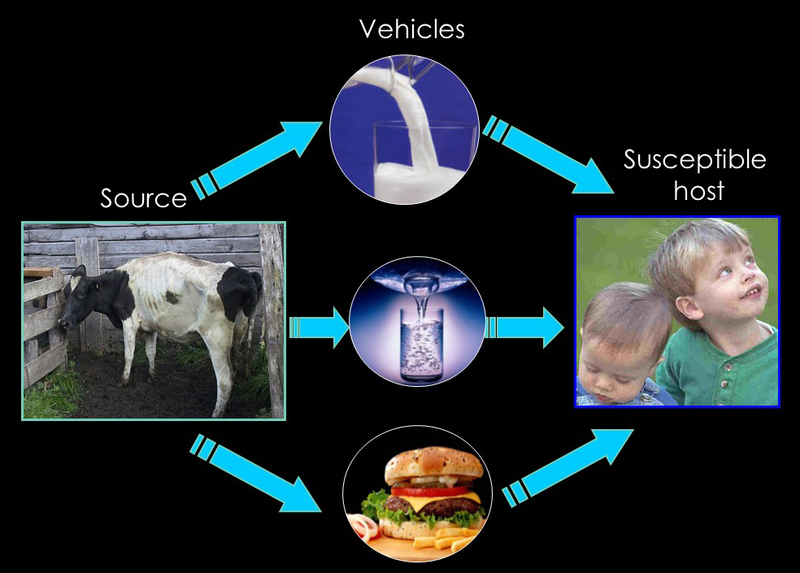 HTST pasteurized milk: MAP is know to survive at low numbers in pasteurized milk. Contact with small ruminants in petting zoos without adequate hand sanitizing facilities. Note: It is unknown how many exposures are needed and how many MAP may be required to initiate infection in a human, or even whether all humans are susceptible to infection. Therefore, it is difficult to predict the importance of if these potential routes of exposure. Also, the age of exposure is likely to be as important in humans as it is in all other animals. 2. Does MAP infect humans? Yes. Two studies, one authored by Abubakar et al. and the other by Feller et al., have assembled publications on studies searching for MAP, or immune responses to MAP, in humans -to establish whether MAP ever infects humans (see publications listed below). Both have concluded that MAP has infected humans although whether these infections subsequently were the direct cause of disease is an open question. In the cases when MAP could be isolated from humans, the genetic fingerprints of the organism were the same as those cultured from animals. Note: Finding evidence of MAP infection does not necessarily indicate that MAP can cause disease in humans. The causation question remains unresolved. 3. Does MAP infection cause Crohn’s disease? In the majority of published studies, evidence of MAP is found more often in people with Crohn’s disease than in other human populations. It is unknown if Crohn’s disease patients developed their disease first and then acquired the MAP infection or whether MAP actually contributed to their disease. Experimental infection trials in humans are unethical so there are no direct ways of proving that MAP causes Crohn’s disease. Evidence will always be indirect or circumstantial. However, the ability to cure Crohn’s disease using anti-MAP antibiotics, if proven, will be highly significant evidence supporting MAP as the cause. 4. What are the arguments for MAP as a cause of Crohn’s disease? Crohn’s disease in humans is similar to Johne’s disease in animals both clinically and pathologically. MAP has been documented to infect nonhuman primates. Human exposure to MAP is plausible by multiple routes (see #1 above). Evidence of MAP is detected in tissues of Crohn’s disease patients more often than controls (see #2 above). Evidence MAP is detected in the blood of patients with Crohn’s disease more often than controls. Crohn’s disease has become a global disease with accelerating incidence in newly industrialised countries whose societies have become more westernised. This pattern is that an infectious disease, not a genetically-mediated autoimmune disorder. The genotypes of MAP found in animals are the same as those found in humans. Crohn’s disease patients have antibody to MAP in their blood more often than controls. Some Crohn’s patients have clinically improved when treated with antibiotics effective against a broad range of bacteria, including MAP. Based on a press release from RedHill Biopharma, a placebo-controlled, double-blind trial of a three antibiotic combination has shown to cause high remission rates in Crohn’s patients. A refereed scientific publication describing the trial is expected in 2019. The Human Para Foundation also has patient success stories. 5. What are the arguments against MAP as a cause of Crohn’s disease? There are some differences in histopathology between Johne’s disease in animals and Crohn’s disease in humans. There is no apparent risk of developing Crohn’s disease for people regularly in contact with ruminants. There is considerable variability in MAP detection from humans among laboratories (i.e. one lab reports that MAP was detected, other labs using the same samples report that MAP was not found). MAP is not seen in tissues of Crohn’s patients using conventional stains for mycobacteria. (MAP is regularly seen by this method in infected cattle, goats, etc.). Some Crohn’s patients have not clinically improved when treated with antibiotics effective against a broad range of bacteria, including MAP. 6. Is there a genetic component to acquiring Crohn’s disease? Yes. Multiple genes have been associated with the development of Crohn’s disease. The two most significant are called NOD2 and ATG16L1 (also known as NRAMP). It is unknown exactly how or why these genes are linked to Crohn’s disease. It is known, however, that these genes regulate the human immune response to intracellular bacterial infections with organisms such as mycobacteria. 7. Is genetics relevant to the theory that MAP contributes to Crohn’s disease? Yes. The same genes linked to Crohn’s disease susceptibility are also linked to mycobacterial and other intracellular bacterial infection susceptibility. 8. Has MAP been described as a factor in human ailments other than Crohn’s disease? Yes. MAP was reported as the cause of lymphadenitis in a child and was detected in a patient with AIDS. In addition, MAP or an immune response to MAP has been found in cases of sarcoidosis, Blau syndrome (eye condition), Type I Diabetes Mellitus, and multiple sclerosis. The Human Para Foundation maintains a website devoted exclusively to human diseases linked with MAP. A review of evidence for a link between exposure to Mycobacterium paratuberculosis and Crohn’s disease in humans. A report for the U.K. Foods Standards Agency. This 55 page document is a report by a scientist independently contracted to evaluate the M. paratuberculosis – Crohn’s disease link. The report is current, comprehensive, concise and lists 242 references. For those interested in this subject it is must reading. Click here to download this 70 page 1 MB pdf document. This link provides access to The European Commission Directorate-General Health & Consumer Protection, Report of the Scientific Committee on Animal Health and Animal Welfare adopted 21 March 2000. This 76 page report is the product of a nine member panel of European experts. It provides an excellent review of the literature listing 372 references in its bibliography. Click here to download this 76 page 1 MB pdf file. Prof. Hermon-Taylor, together with Dr Tim Bull and other members of the team at St George’s University of London and scientists at the Jenner Institute University of Oxford, developed a modern DNA vaccine against MAP. The Crohn’s MAP Vaccine team supports this ground-breaking work led by Dr Amy Hermon-Taylor (Prof. Hermon-Taylor’s daughter) and a large group of volunteers all of whom are directly affected by Crohn’s disease. The Crohn’s Connection by Lisa Chamberlain. Cleveland Free Times, June 16-22, 1999. Also available through Project Censored: Bacterium in cow’s milk may cause Crohn’s disease. Paratuberculosis And Crohn’s Disease: Got Milk? by Michael Greger, MD, Updated January 2001. Abubakar, I., Myhill, D., Aliyu, S.H., et al. 2008. Detection of Mycobacterium avium subspecies paratuberculosis from patients with Crohn’s disease using nucleic acid-based techniques: a systematic review and meta-analysis. Inflamm. Bowel Dis. 14:401-410. Alonso-Hearn, M., Molina, E., Geijo, M., et al. 2009. Isolation of Mycobacterium avium subsp. paratuberculosis from muscle tissue of naturally infected cattle. Foodborne Pathog. Dis. 6:513-518. Behr, M.A. & Kapur, V. 2008. The evidence for Mycobacterium paratuberculosis in Crohn’s disease. Curr. Opinion Gastroenterol. 24:17-21. Behr, M.A. 2010. The path to Crohn’s disease: Is mucosal pathology a secondary event? Inflamm. Bowel Dis. 16: 896-902. Chamberlin, W., Ghobrial, G., Chehtane, M., et al. 2007. Successful treatment of a Crohn’s disease patient infected with bacteremic Mycobacterium paratuberculosis. Am. J. Gastroenterol. 102:689-691. Eltholth, M.M., Marsh, V.R., Van Winden, S., et al. 2009. Contamination of food products with Mycobacterium avium paratuberculosis: a systematic review. J. Appl. Microbiol. 107:1061-1071. Feller, M., Huwiler, K., Stephan, R., et al. 2007. Mycobacterium avium subspecies paratuberculosis and Crohn’s disease: a systematic review and meta-analysis. Lancet Infect. Dis. 7:607-613. Greenstein, R.J. 2003. Is Crohn’s disease caused by a Mycobacterium? Comparisons with leprosy, tuberculosis, and Johne’s disease. Lancet Infect. Dis. 3:507-514. Kirkwood, C.D., Wagner, J., Boniface, et al. 2009. Mycobacterium avium subspecies paratuberculosis in children with early-onset Crohn’s disease. Inflamm. Bowel Dis. 15: 1643-1655. Lidar, M., Langevitz, P., & Shoenfeld, Y. 2009. The role of infection in inflammatory bowel disease: initiation, exacerbation and protection. Isr. Med. Assoc. J. 11:558-563. Mutharia, L.M., Klassen, M.D., Fairles, et al. 2010. Mycobacterium avium subsp. paratuberculosis in muscle, lymphatic and organ tissues from cows with advanced Johne’s disease. Int. J. Food Microbiol. 136:340-344. Nacy, C. & Buckley, M. 2008. Mycobacterium avium paratuberculosis: Infrequent human pathogen or public health threat? American Society for Microbiology, Washington DC, USA. Naser, S.A., Collins, M.T., Crawford, J.T., et al. 2009. Culture of Mycobacterium avium subspecies paratuberculosis (MAP) from the blood of patients with Crohn’s disease: A follow-up blind multi-center investigation. The Open Inflamm. J. 2: 22-23. Naser, S.A., Ghobrial, G., Romero, C., et al. 2004. Culture of Mycobacterium avium subspecies paratuberculosis from the blood of patients with Crohn’s disease. Lancet. 364:1039-1044. Netea, M.G. & Joosten, L.A.B. 2010. A NOD for autophagy. Nat. Med. 16: 28-30. Sartor, R.B. 2005. Does Mycobacterium avium subspecies paratuberculosis cause Crohn’s disease? Gut 54:896-898. Schurr, E. & Gros, P. 2009. A common genetic fingerprint in leprosy and Crohn’s disease? New Engl. J. Med., December 16, 2009. Selby, W., Pavli, P., Crotty, et al. 2007. Two-year combination antibiotic therapy with clarithromycin, rifabutin, and clofazimine for Crohn’s disease. Gastroenterol. 132:2313-2319. Wang, T.T., Dabbas, B., Laperriere, D. et al. 2010. Direct and indirect induction by 1,25-dihydroxyvitamin D3 of the NOD2/CARD15-defensin beta-2 innate immune pathway defective in Crohn disease. J. Biol. Chem. 285:2227-2231. Zhang, F.-R., Huang, W., Chen, S.-M. et al. 2009. Genomewide association study of leprosy. New Engl. J. Med. 361:2609-2618. Scientific studies convincingly argue both for and against an association of MAP with human disease. Literature in this field is extensive, very technical, controversial and hotly debated among scientists. At the risk of over-simplification, we present here a compilation of findings on this important issue.